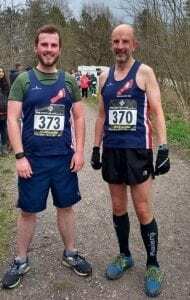 Sunday 14th April saw David Denton’s annual Peat Pit Woods fell race take place, moved forward by one week from its usual Easter Sunday slot due to a clash with another race this year. The race is a short and lively undulating route of two laps around Shining Cliff Woods at Alderwasley, 2.7 miles in total. Conditions were dry (and cold!). There was also a one lap option for juniors. Chris Gillott finished 22nd in 21.07, (over one minute quicker than last year); and Tom Gillott (taking part in his first ever fell race!) finished 61st in 26.25. Overall winner was Samuel Moakes of Sutton-in Ashfield in 15.04; first female was Ruth Keeley of Belper Harriers in 20.43. there were 81 runners in total. The race is repeated on Sunday 12th May, on a slightly extended course. See http://www.runningwithdavid.com for details of this and other races, including the forthcoming Derwent Valley Series.